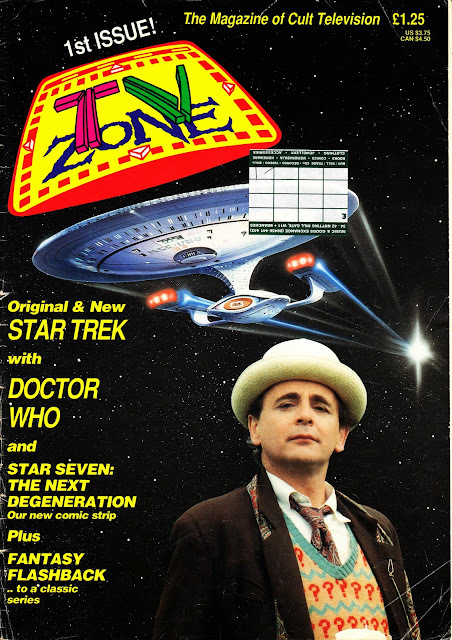 Here's another start for a long-runner: a (slightly battered) copy of Visual Imagination's Starburst spin-off TV ZONE, launched September-October 1989. The TV Zone column (with the same crappy logo) had been running for a while in Dez Skinn's pre-Marvel creation and, with the boom in new small screen SF (and home video tentatively making some archive material, notably Doctor Who, available for the first time), a spin-off (albeit initially bi-monthly) must have seemed a no-brainer. Forget the IDW WHO/ TREK crossover extravaganza: all you need is sharp scissors and a Pritt-stick to cobble together your own Timelord-meets-Trek blockbuster. The contents were also similarly primitive but - at the time - were pretty cool. The News page was just that: one page of big-fonted type revealing that Robin of Sherwood was coming to tape, War of the Worlds was being retooled for season two and fan-favourite Beauty and the Beast wasn't cancelled after all. The articles followed Visual Imagination's (the clue is in the name) tried-and-tested formula of minimal words accompanied by as many nice pictures as possible. It's a slim read, both in terms of page count and words. Several pages were even filled by the unwelcome (and swiftly dispatched) comic strip Star Seven: The Next Degeneration. A feature - ahem - better suited to a fanzine. The first featured Fantasy Flashback was SPACE 1999's opener: Breakaway. The feature's initial formula - which continued for years - was a verbose summary of the episode followed by minimal background/ making-of information. Over time (especially under the auspices of Andrew Pixley), it evolved into a far more detailed account of production with the summary itself reduced to a sidebar. This was a bit of a boom time for cult screen magazines: Marvel UK inexplicably decided to get back into the game with FANTASY ZONE (see here) at the same time, the almost-professional fanzine DOCTOR WHO BULLETIN had broadened its remit (partly to boost sales, partly to avoid accusations from the BBC and Marvel that it was encroaching into DOCTOR WHO MAGAZINE's officially-licensed territory) to become DWB (latterly DREAMWATCH) whilst, of course, STARBURST under its new owner was still going strong. And copies of STARLOG, THE OFFICIAL STAR TREK: THE NEXT GENERATION MAGAZINE, THE STAR TREK FAN CLUB MAGAZINE and others were crossing the Atlantic if you knew where to look. TV ZONE enjoyed a long, and occasionally illustrious, life: clocking-up 231 issues (and numerous specials) through to the end of 2008. The last months saw publication, and distribution, becoming increasingly patchy, coupled with a noticeable decline in quality. Visual Imagination succumbed in early 2009 although Starburst eventually emerged from the wreckage. TVZ spawned, directly or indirectly, several spin-off of its own: the long-running CULT TIMES was basically a TV guide for cult TV (although the realities of TV scheduling made it all but impossible to include the terrestrial channels) supplemented by features published in the largest possible type size. X-POSE started-out as a Fortean Times wannabe before happily settling into yet another outlet for pictures of Gillian Anderson. ETV (Emergency TV, apparently) attempted to capitalise on the success of folks-in-uniform type shows... but it didn't last long.